The X1 is not only among BMW's first launches of the year but easily their most important. This is the new entry level BMW SUV and by new we mean all-new. BMW started from scratch, with a new Mini based platform that is now front-wheel biased unlike the old, rear-wheel drive X1. We'll get to that later. For now, let's focus on the design. One of the previous gen BMW X1's biggest shortcomings was that it simply didn't look the part of a rugged SUV. But that's in the past because the new car looks like it belongs to the X family and it appears tough and imposing despite being the youngest sibling. The new X1 has a handsome face with smart wraparound lamps that taper towards a large kidney grille. The trademark twin corona ring lamps ensure the X1 will never be mistaken for anything but a BMW. Full LED headlamps with a cornering function are now standard. The side cuts a similar profile to the BMW X3 but appears a little lower (it's actually 53mm taller than the old X1) and this gives it a sporty effect. The rear end has twin pipes and a well executed pair of LED lamps that taper in a similar fashion to the headlamps. There's a also a neatly integrated spoiler that has a smart back trim along the sides. This car is in the top M Sport trim which means it gets more aggressive bumpers, and black treatment around the windows and on the roof rails. The rear bumper gets a smart looking gloss grey trim but we wonder how this will stand up to attack from road debris and stone chips. The good news is the that the M Sport trim has the same 165mm ground clearance as the other trims. There's also a cool M style key fob and lovely 18-inch M branded wheels. However, the best feature of the M Sport kit is the segment first head-up display which shows more than just speed, including turn by turn navigation data, audio information and the door open warning. 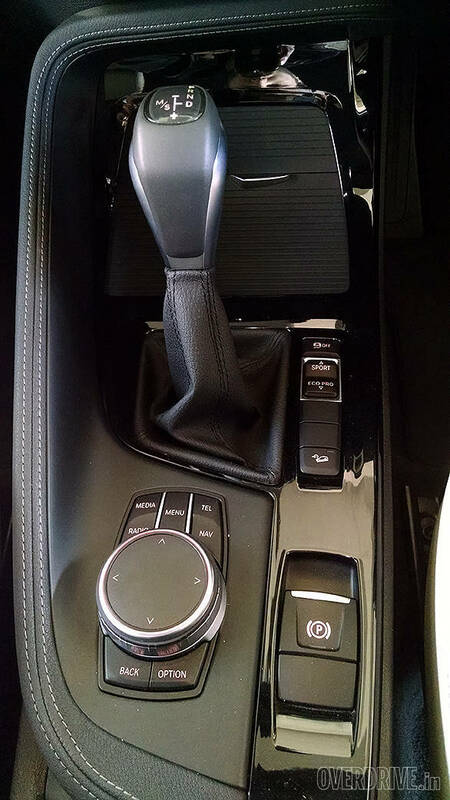 The goodies in the cabin include an M steering wheel and sporty M seats that are both comfy and very supportive. Both front seats are powered and have extendable squabs while the driver seat gets two programmable memory positions. 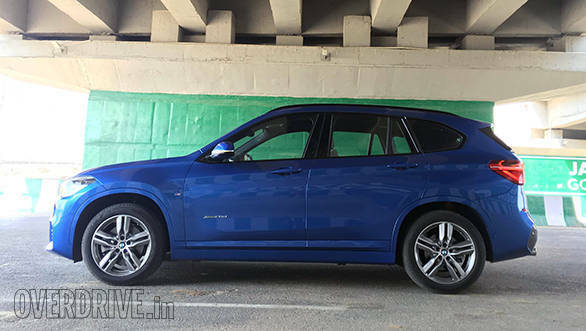 The next big improvement over the outgoing BMW X1 is the cabin. 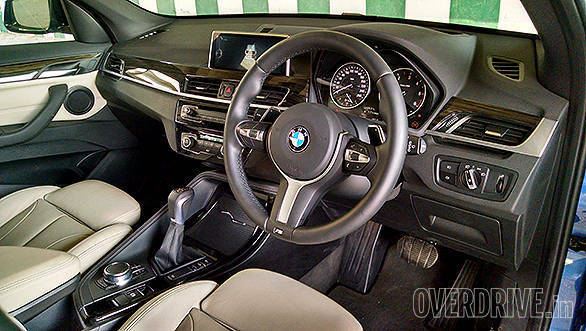 The dash is typical BMW and keeping with tradition, it is oriented towards the driver. There's a crisp 22.3cm screen (the lower models get a lower resolution 16.5cm screen) and it's all controlled via a touch-sensitive iDrive jog dial on the centre console. Audio connectivity options include a USB port, an AUX port and Bluetooth streaming. There are four 12V power outlets in the cabin - two in the front, one in the middle and one in the boot. Most importantly, the BMW X1 now has actual space in the rear, far more than the old car. A segment first, the rear seats slide forward and back and can also be reclined to a small extent. Kneeroom is quite generous, even for tall occupants and there's more than enough headroom. Dual rear AC vents add to the comfort quotient while a double panorama sunroof and large windows make for an airy cabin. The 505-litre boot is easily big enough for a family of four. It can be further increased to 1,550 litres at the pull of two switches on either side of the boot that electronically drop the 40:20:40 split rear seats. Overall, the X1 cabin may not be stunning to look at but it now boasts genuine space and comfort. As with the recently launched facelifted 3 Series, BMW is sticking with a diesel-only approach for the X1 at launch. There's one engine available and it is the familiar 1,995cc four cylinder turbocharged diesel. However, BMW haven't simply shoehorned the old motor in. Instead, it's been worked on to produce more power and torque, now making a total of 190PS at 4,000rpm and 400Nm at 1,750-2,500rpm thanks to revised higher fuel pressures, and redesigned lower weight internals. 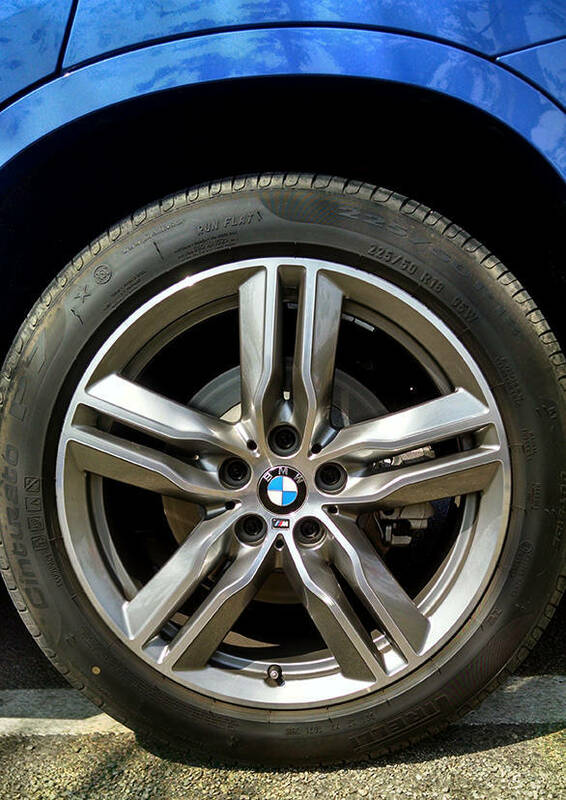 A similar 8-speed automatic from most BMWs finds its way here and is as smooth and responsive as a vehicle like this could ever need be. The motor feels familiar with a free revving nature but a rather loud note. Stand next to the car at idle and you'll be greeted by quite a fair amount of clatter. Fortunately the sound insulation reduces it to a much quieter level in the cabin. There are three driving modes, Eco, Comfort and Performance. These work based on engine mapping and steering weight. 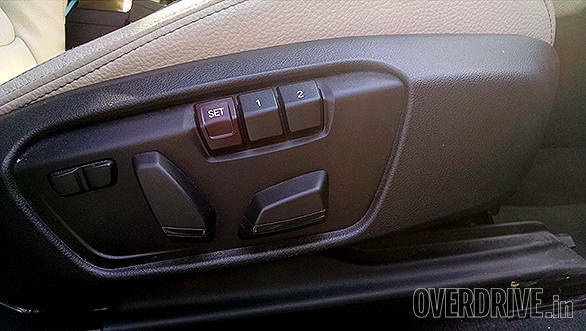 Eco mode reduces throttle response and reduces the climate control's load on the engine. Sport mode deactivates the start-stop function, increases throttle response and generally makes the X1 feel sharper and more reactive. Performance is sprightly and the 0-100kmph time is 8.4 seconds while top speed is a claimed 219kmph. It's fast but efficient, returning 12.1kmpl in city and 17.9.kmpl on on the highway. So far it's been all good news but this is the one area that the BMW X1 could falter. One of the ways (including increasing overall dimensions) BMW have managed to liberate so much space over the earlier car is by mounting the engine transversely instead of longitudinally. That means power is primarily sent to the front wheels. 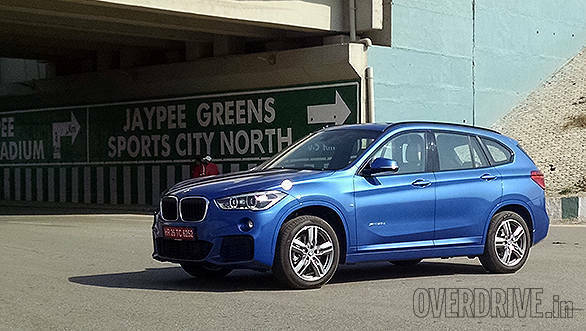 Yes, that's right, the X1 is the first front-wheel-drive vehicle from BMW in India. That's something the purists are going to be livid about but front-wheel-drive platforms are cheaper to make and it was bound to happen. However, unlike in the previous rear-wheel-drive only X1, BMW will now offer a choice of front-wheel-drive or all-wheel-drive. 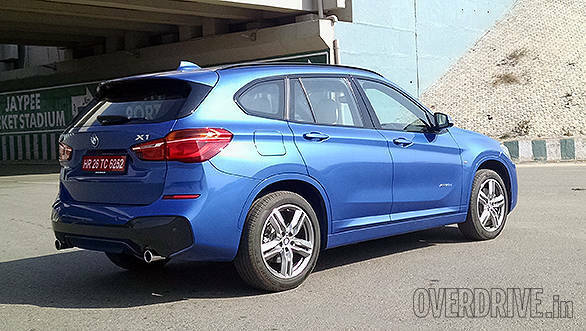 So in that sense, the X1 is now more of an SUV than it was earlier. There's a choice of two models with front-wheel-drive and two with all-wheel-drive. The models called sDrive are front-wheel-drive while the models named xDrive are all-wheel-drive.The xDrive 20d M Sport model gets all-wheel drive as standard. The AWD system functions primarily as a front-wheel-drive system but can divert 100 per cent of the power to the rear within a fraction of a second should the situation require it. The question is, how does this vehicle stack up against the old X1 that made up for all its vices by being a blast to drive. The previous BMW X1 was so much fun because it was literally a 3 Series on stilts. The new one feels rather different and it is now more of an involving SUV than a raised sedan. It doesn't have the same rearward bias but counters with high levels of grip. The electrically assisted steering has some weight and decent feel to it. It's not as heavy as the old car's hydraulically assisted rack unit but it isn't as communicative either. Direction changes are quick and you can throw it into a corner and it holds the line you've chosen. There's a bit of body roll and understeer will eventually set in, but the limit is high enough for the X1 to be quite entertaining. The brakes have an energy regeneration feature and are progressive and powerful at speed. We did find them slightly grabby in traffic, a typical complaint with these regenerative systems. The old X1 had unreasonably firm ride quality and while the new one improves on this considerably, it is still on the firmer side of the segment. The 18-inch run-flat wrapped wheels are definitely partly to blame here. Run flats are not sensible for India but the good news is that the BMW X1 has a neatly integrated space saver under the boot. Ride is quite plush on smooth roads but tends to thud through surface height changes, speed breakers and potholes. It's not uncomfortable but not great either. 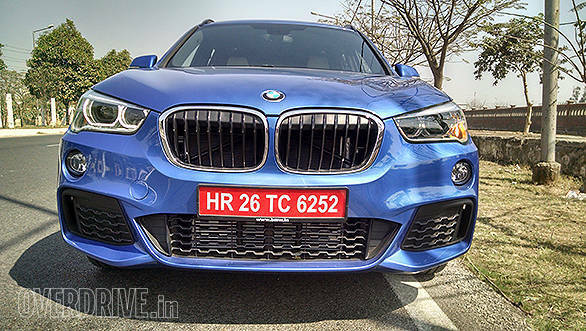 The BMW X1 is well specced across the models but the M Sport gets some exclusive features. Let's start with what all the variants get - LED headlamps with cornering function, rain sensing wipers and auto headlamps, dual zone climate control, an auto-dimming inside rear view mirrors, push button start and auto start-stop. Safety is a priority and all variants get six airbags, ABS and a comprehensive stability control package. Now onto the stuff only the top M model has - leather seats, the larger iDrive screen with a touch-sensitive controller, HUD and of course, the M Sport visual goodies. Strangely, this is another expensive German car that doesn't offer the very practical feature of keyless entry found on run-of-the-mill Rs-7-lakh hatchbacks. The X1 is a really big step over its predecessor and a better vehicle in almost every way. It is now stylish, genuinely spacious and finally offers all-wheel drive. Pricing goes like this - sDrive20d Expedition is priced at Rs 37.75 lakh (all prices on road Mumbai), sDrive20d xLine at Rs 42.67 lakh, xDrive 20d xLine at Rs 45.12 lakh and finally the xDrive M Sport at Rs 48.93 lakh. That puts it on the higher side of the segment and about Rs 6 lakh more than the smaller Mercedes-Benz GLA. However, the M Sport manages to undercut its main rival, the top Audi Q3 Premium Plus by about Rs 20,000. There's no doubt that the new X1 is going to do considerably better than its predecessor.